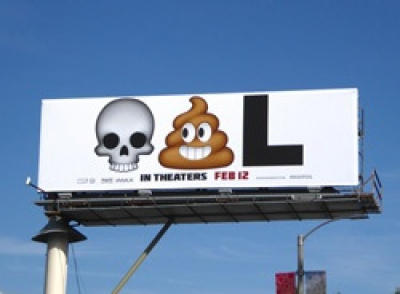 Emoji Marketing: Pitfall Or Evolution? Is emoji marketing the future of business communications? We as a species are genetically wired to remember a human face almost (but not quite) as well as we can remember that fire is hot and will burn us. Our brains react to imagery. A single picture can speak a thousand words. That’s why now, in 2016, the widespread use of emoji marketing shouldn’t come as any real shock. Another thing that’s understandable is how businesses have been hesitant about the adoption of emoji marketing into their customer communication lexicon. Emojis have been - from the point of view of businesses - thought of as a form of communication that might cheapen a brand, shrouding it in an unprofessional cloak. People look at emojis as an extension of text slang or text acronyms (i.e., lol, brb, YOLO etc), a no-no in business communications. What businesses are now starting to realise, however, is that emojis play a vital role in developing a brands digital presence and connecting with customers. Businesses can actually leverage this new mode of communication and reap in massive rewards. Because the fact is that, at least for the time being, emojis are now a big part of communication for individuals from all generation groups and frankly are here to stay. So with that said then, let’s take a little looksee at how businesses are getting creative in the world of miniature picture messaging. Twitter is a space in which emoji-infused marketing can work wonders, and Bud Light shows us how a simple yet creative use of emojis can speak so much more to its customers than any 140 character Tweet could. 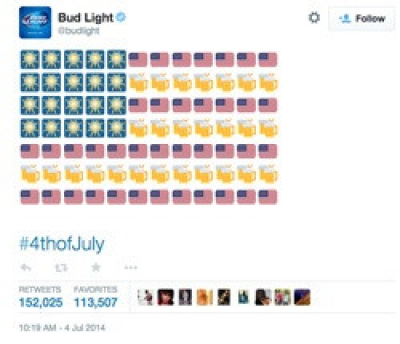 In a clever bid for our attention on one of the America’s most patriotic days—the 4th of July—the beer conglomerate posted a Tweet of the American flag composed of emoji American flags, fireworks, and beer. The Tweet garnered over 150,000 retweets, a testament to just how much people truly enjoyed watching a company let their hair down embrace a social trend enjoyed by millions around the globe. The greatest thing to marketing, and especially emoji marketing is that creativity is only bound by imagination. The promoters of the recent DeadPool blockbuster show us exactly how this can be done. For those of you not familiar with DeadPool, he’s a comic book superhero / anti-hero who’s as morally ambiguous as the some of the most compelling characters in literature. He’s basically a comic provocateur looking out for no. 1—DeadPool. I won’t bother explaining this one. I’m sure you can figure it out. 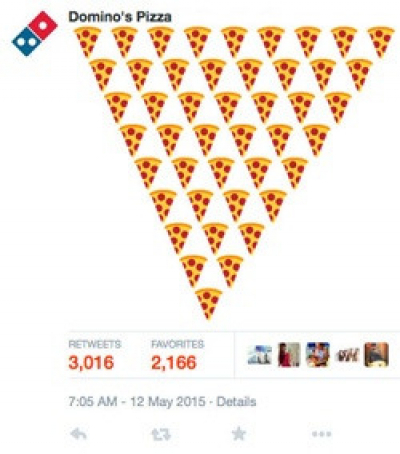 Domino’s is a pizza business that understands what’s important to them: pizza! Specifically, getting people to order their pizza. They’ve been in the pizza game for a while now, and so they’ve figured out that the best way to accomplish this task is to shorten the the line between their pizza and their customers through streamlining their delivery system and simplifying their communications with and customers. Making it super simple for people to order is Domino’s gold mine. That’s why they’ve incorporated the pizza emoji into their ordering system, and in doing so have reduced the time it takes for a customer to order a Domino’s pizza to under five seconds. Clicking on an emoji of a smiling head, for example, directed you to a video of Bill Nye the science guy talking science stuff, and clicking on a rocket-ship emoji directed users to information about NASA’s rockets. All in all, it is using emojis in a super clever way to engage and entertain both at once. I said at the beginning of this article that it was for good reason that businesses have kept emojis at an arm’s length. But there’s a caveat that comes with that line of thinking. While it’s true that there are always risks businesses take by jumping eyes closed onto the next fad, not taking these chances also poses a risk. The simple fact is that pictures evoke emotion, pictures speak louder than words, pictures convey and pack plenty of meaning into symbols—and emojis, my friends, are just little pictures. More and more businesses are using emojis for B2C marketing, just as they should be. It’s no longer novel. Some might still scoff at it and that’s fine. None of that changes the plain act that emoji marketing, if used correctly, can work wonders for your business. And guess what? 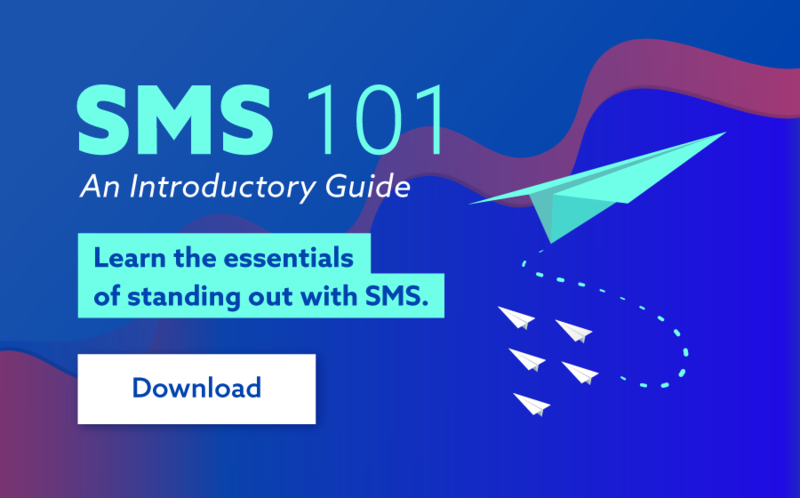 It can be incorporated into our SMS platform. So if you’d like to find out more, get in contact with us today.